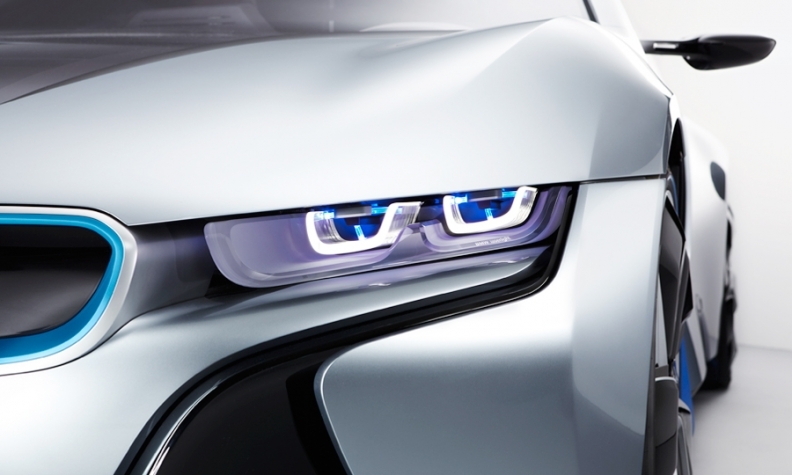 At the Frankfurt auto show, the BMW i8 concept EV featured energy-efficient laser headlights. Engineers now are working on a production version. At first glance, the BMW i8 concept's laser headlights that debuted in September looked like vaporware, gee-whiz technology that will never make it the showroom. But BMW engineers say their laser headlights have big advantages over LEDs, or light-emitting diodes, and they are working to commercialize the lights. Laser headlights use less than half the energy of LEDs, and their light intensity is a thousand times greater, BMW says. Moreover, a laser diode is one-hundredth the size of an LED diode, which allows designers to shrink the headlight. "We see a lot of advantages," says Hanafi Abdul, BMW's optical systems designer. "We can reduce power consumption and weight, and it provides our stylists more freedom to produce beautiful shapes." Here's how BMW's laser headlights work: In each headlamp, three small diodes generate blue laser beams only 10 microns wide. Those beams are aimed at small mirrors, which reflect them onto a lens. Inside the lens is yellow phosphorus, which emits an intense white light when activated by the lasers. That light is bounced off a reflector onto the road ahead. So what is visible is the white light emitted from the lens, not actual laser beams. But there are technical hurdles. Abdul says the laser generators are sensitive to heat and vibration, so engineers are devising a cooling system. BMW, which developed the laser headlights, is working with suppliers that Abdul declined to name. In September, BMW said its engineers are working on laser technology for production "within a few years." Abdul confirmed the timetable. "We already are working on some production development," he says. "Next year, we'll be able to talk about it." Abdul left the impression that BMW has a sense of urgency about lasers - even though LEDs, which lasers eventually could replace, are still relatively new. Perhaps it's because BMW's rivals are working on lasers, too. For German automakers, the Frankfurt auto show has become a can-you-top-this technology extravaganza. At the Frankfurt show in September, the Audi A2 concept sported rear fog lights that use diodes to generate laser beams. In the fog or rain, the lasers project images of red triangles onto the road as a warning. So if BMW doesn't adopt lasers, one of its rivals probably will.